In view of the alleged democratic deficit at the European level, it is all the more important that the administration of European law suffers neither from an application or enforcement deficit nor from a judicial deficit. This concern is particularly acute when the Member States depend on each other for the effective implementation of European law. Since the Treaty leaves the administration of European law primarily in the hands of the Member States without offering a legal basis for the harmonisation of procedural administrative law, each area of law has its own administrative procedural rules. It is evaluated in the context of Community product regulation whether the available European rules are adequate to enable the administration to achieve the aims of the legislation - the free movement of authorized products on the internal market and a high level of protection for the environment or public health - and guarantee respect for the right to be heard and the right to judicial protection as well. 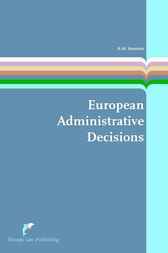 This research showed that many lessons could be learned from the regulation of products in order to improve the drafting of European legislation that produces European administrative decisions. Then it is no longer necessary to reinvent the wheel each time effective implementation requires administrative cooperation between the Member States and the Community institutions and bodies. The main result of administrative cooperation between the Member States, with the aid of the Community institutions and bodies, is the creation of administrative decisions with EU-wide effect. This occurs for instance through mutual recognition of administrative decisions. The exchange of information and mutual assistance should give enforcement EU-wide effect as well, but this is still fledgling in the area of EC product regulation. The development of rules which ensure respect for the right to be heard and to judicial protection is also lagging behind. That leads to gaps in the legal protection of individuals.